Paradise House is nestled in a quiet cul-de-sac with off-street parking, only 1 km from the Waterfront and Town Centre, Paradise House offers its guests the opportunity to sample a number of Knysna's many attractions. Come relax in paradise! 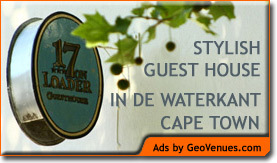 Our picturesque accommodation is situated in the beautiful town of Knysna. Paradise House is the perfect get-away for the discerning traveller or those looking to just unwind. Johan and Zita Petzer will welcome you to one of their four luxurious en-suite rooms or their spacious self-catering apartment. Wake up and enjoy stunning panoramic views or simply indulge in the natural beauty of the surrounds. Beaches, rivers, lakes and lagoons provide ample opportunity for water-sports, while mountains and forests beckon hikers, riders and cyclists alike. There are many activities for the outdoor enthusiast to choose from, both gentle and for the more adventurous. A range of eco-adventure companies offer safe, guided activities. Knysna offers a selection of fine restaurants, seafood taverns, pubs, coffee shops and eateries, something for everyone and every budget.Shopping is a very popular past-time for visitors.